LP Siding, Ceilings, and an Inspector’s questions! This Monday, the Pole Barn Guru discussed attaching LP siding on a post frame home, installing ceiling panels, and an Inspector’s questions. DEAR TRENT: My own home features steel siding and wouldn’t consider doing it any other way. Besides being less expensive to install (both material and labor), steel siding will prove to be extremely durable and requires no maintenance. For sidings such as LP lap, you can still use bookshelf girts, reducing girt dimensions from 2×8 to 2×6 and placing vertical 2×4 nailers every two feet upon girt exterior face running from pressure preservative treated splash plank up to soffit supports. This results in a savings of around 20% in assembly framing lumber. DEAR BERNIE: By “strapping” I will guess you are meaning supports for the steel ceiling liner panels. If you install panels perpendicular to trusses you can screw directly to bottom chords without any additional framing. DEAR RICK: Justine forwarded to you manufacturer’s warranty information in regards to your building’s glulaminated columns, specifying level of treatment as adequate for structural in ground use. Your inspector will be merely enforcing information denoted upon your engineered building plans. Unless called out for otherwise, all holes in hangers having wood to nail into must be filled. If nailing into a two ply member (e.g. double truss) 10d common x 3″ nails should be used. I also just happened to have a Simpson LU28 sitting next to me atop my desk – I count three holes per side to nail into purlin and four holes per side to nail into truss, total of 14 holes per bracket. This entry was posted in Pole Barn Questions, Constructing a Pole Building, Pole Building Siding, Trusses, Fasteners and tagged treated posts, siding options, fasteners, ceiling load trusses, ceiling steel, lap siding, Ceiling on February 18, 2019 by admin. This week the Pole Barn Guru answers questions about installing solar panels on the roof, the “squaring” of a building, and rotting of posts. DEAR CARMEN: We can have your new post frame building engineered to support any amount of snow load, as well as any weight of solar panels, or other materials or systems you might want to either place upon, in, or hang from the roof system, and of course the building frame which supports it. DEAR JAMES: Our hope will be “square by the township” merely means prior owner neglected to acquire needed permits (rather than building as constructed happens to be out of square). Before moving forward you should be visiting your township planning and building departments to determine exactly what issues exist. It could be your unfinished pole barn has been started in a disallowed portion of your property. Once you have cleared things up with your officials, we could provide structural plans and materials for an attached lean to (again providing it meets with your Planning Department’s requirements). DEAR GREGG: I would sure like to see scientific proof from these “many folks”. Properly pressure preservative treated columns rotting from any cause would be just another old wives’ tale (no offense meant to old wives). This entry was posted in Pole Barn Questions, Constructing a Pole Building, Trusses, Footings, Columns and tagged solar panels, treated posts, Roof dead loads, post rot, square roof, building square on February 11, 2019 by admin. 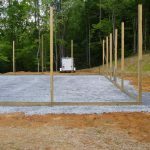 This week the Pole Barn Guru answers questions about properly treated posts, building on hillside locations, and an option to build with post frame. 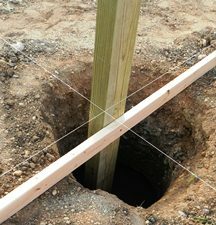 DEAR POLE BARN GURU: According to most of the answers on the Internet, if I bury the posts for my deck they will rot away and the whole thing will come crashing down 10 or so years. What proprietary space-age technology are you using in your pole barns that deck builders don’t know about? DEAR MM: How about we start with over 50% of all builders did not graduate from high school? The great majority of deck builders call in, text or email the lumber list for the next deck to their supplier of choice. I worked in or owned my own lumber yards for years and never, ever can I recall a builder specifying a level of treatment when they ordered pressure preservative treated wood. Builder says treated, and he gets treated….probably not adequate for most applications. Any lumber placed structurally into the ground should be treated to a minimum UC-4B retention. I wrote this article for Rural Builder magazine, so it is directed specifically towards builders and suppliers, however it should make my point: https://www.hansenpolebuildings.com/2014/05/building-code-3/. DEAR ROBIN: San Dimas – the town Bill and Ted made famous! Post frame (pole) buildings perform admirably on hillsides, as they can be attached to partial foundations (https://www.hansenpolebuildings.com/2012/02/grade-change/) or built on stilts (https://www.hansenpolebuildings.com/2017/09/stilt-houses/) to compensate for grade changes. As far as seismic design, structures are affected by earthquake in relationship to the weight of the structure. The lighter the structure, the more resistant it is to tremors! Here is a little earthquake reading: https://www.hansenpolebuildings.com/2015/10/a-whole-lotta-shakin-going-on/ and https://www.hansenpolebuildings.com/2016/05/earthquake-resistant-post-frame-construction/. DEAR POLE BARN GURU: I am in the engineering phase of our forever home in Minnetonka. I have an architect drafting my designs, and am now working with structural engineers to figure out the best way to construct it. 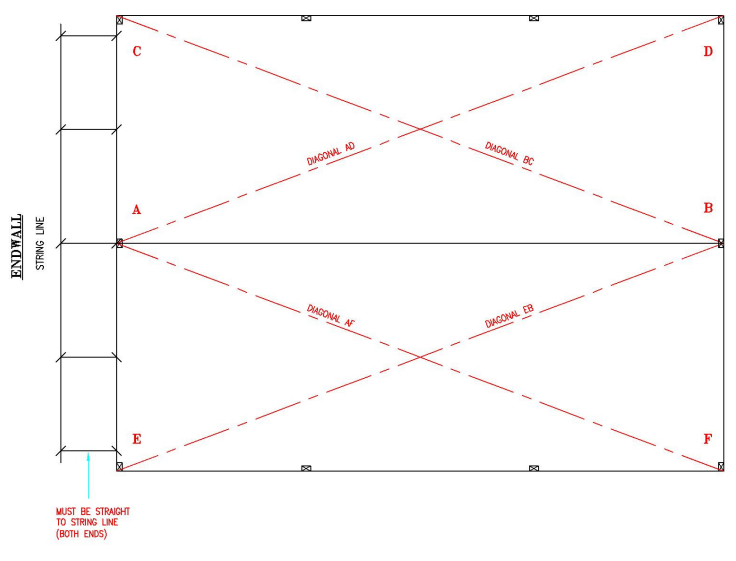 My original plans show double stud 2×4 walls (for super insulation), and our ceiling heights are on the tall side. An option we are considering is getting the house pole framed for the interior stud wall, and then site framing the exterior stud wall, in order to create the cavity for super insulating. I also plan to use an interior ledger system for the floor joists. Let me know if you think this is a possibility. I can send you our current drawings for you to look at. There are obviously a lot more details to sift through than what I’ve covered in this email. 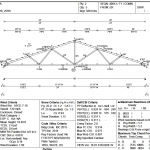 DEAR SONJA: One of the great features about investing in a post frame building kit package (at least from Hansen Pole Buildings) is it includes the engineered structural plans for your new home – no need to pay an expensive structural engineer! 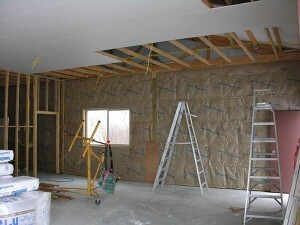 There is probably a much easier way to achieve your super insulated walls – using post frame construction and ‘commercial’ bookshelf style girts, you can create a deep wall insulation cavity for one or a combination of the following: unfaced fiberglass or rock wool (best since it is not effected by moisture) batts; BIBs (https://www.hansenpolebuildings.com/2011/11/bibs/); and/or closed cell spray foam. Between the inside of the framing and the wallboard, use high R insulation board, which creates a thermal break between and wall framing and the interior conditioned space. We’d be pleased to assist you in your project. This entry was posted in Insulation, Pole Barn Design, Columns, Pole Barn Homes and tagged treated posts, hillside building, UC-4B, post frame house, seismic load, super insulate on July 30, 2018 by admin. Welcome to Ask the Pole Barn Guru – where you can ask questions about building topics, with answers posted on Mondays. With many questions to answer, please be patient to watch for yours to come up on a future Monday segment. If you want a quick answer, please be sure to answer with a “reply-able” email address. Because pole buildings do not have bearing walls, (unlike stick frame construction), the trusses on the endwalls of the building can be set to a different height than the interior trusses. This allows for them to be lowered far enough so the roof purlins in the end bays with overhangscan be run across the top of the end truss. This makes for endwall overhangs which are not “cobbled together” and assurance of straight lines. Assuming a building with trusses and columns every 12′, the interior trusses will be designed for a pair of trusses to support 12 feet of roof (or a tributary area of six feet per truss). The end truss supports 1/2 the distance to the first pair of trusses (six feet in this example) PLUS the length of the overhang past the end of the building. Having to also support the overhanging distance is widely overlooked by Building Designers, builders, truss manufacturers and Building Officials. The end truss will need to be lowered by the thickness of the roof purlin ADJUSTED FOR THE SLOPE OF THE ROOF. This is a difficult concept for most people to grok (absorb). 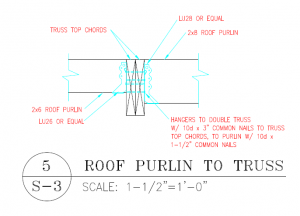 With 2×6 roof purlins (which measure 5-1/2 inches in height), the end trusses need to be lowered by 5-13/16″ in order to keep a smooth roof plane. Purlins should be attached to the top chord of the end truss by use of an engineered mechanical hanger, to prevent uplift. In most cases a Simpson H-1 is adequate to withstand those loads (however it should be confirmed by a RDP (Registered Design Professional – engineer or architect). Read https://www.hansenpolebuildings.com/blog/2013/08/simpson/to find out from real life experience why this is a good idea. Solid blocking should be placed between the purlins, on top of the end truss. This will prevent flying critters from making your building their new home, as well as providing a point for attachment of any soffit panels for enclosed endwall overhangs. DEAR KELLY: While cedar has some natural resistance to decay, it is just not going to afford the lifespan of a properly pressure preservative treated timber. You should be looking for treated columns which have a minimum rating of UC-4B (https://www.hansenpolebuildings.com/blog/2014/05/building-code-3/). Provided the posts are milled to a 5-1/2” x 5-1/2” dimension, you could alternatively use Plasti-Sleeves with them https://www.hansenpolebuildings.com/blog/2012/04/plasti-sleeves/ to help prevent future decay. It is important to have the bottom of the holes below the frost line. There should be a concrete footing below each column of at least eight inches in thickness, as well as 10 inches or more of concrete up the sides of the column to help resist uplift. 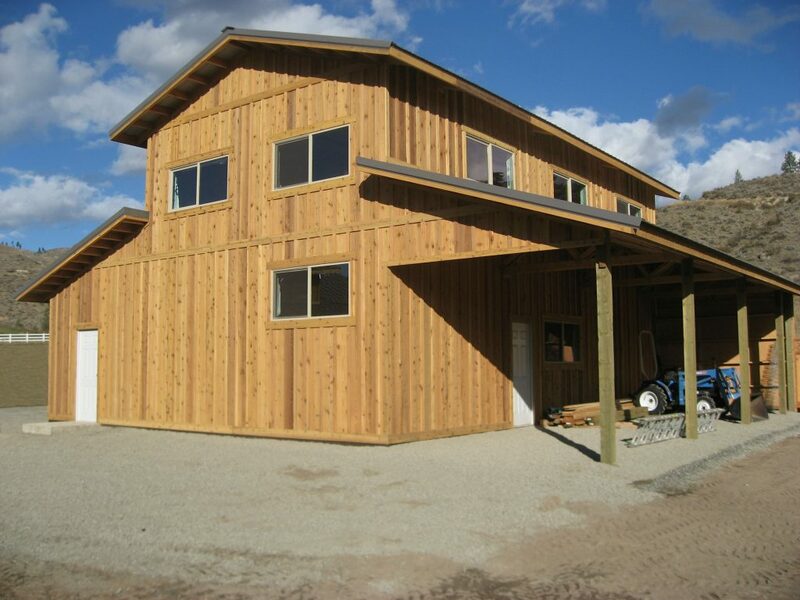 DEAR POLE BARN GURU: I am moving to Reno, NV…. out in the wood!!! Not in town. You have to be a qualified to do the required Engineering FOR NV. Are you able to do so???? DEAR TONY: Washoe county is a stickler for requiring engineering in order to acquire building permits. We’ve done several buildings in the county, and our engineers are registered in every state – the answer to your question being YES we can do so. Why is requiring engineering not dumb? Because buildings designed using seat-of-the-pants engineering tend to fall down and destroy personal property, as well as hurt, maim, or kill occupants – none of which is good. DEAR BECKY: For buildings with steel roofing and/or siding, these materials will arrive at your building site on what is known as a route truck. Your order is very probably one of a huge number on the truck and trailer, which is loaded very close to its 80,000 pound maximum capacity when it leaves the plant. The truck will make many stops and orders are loaded so the first delivery is on top, etc. As many of the deliveries are at lumber yards, or to builders or others who have adequate equipment to offload the steel, they are not charged for the driver to use his offloading machinery. If you do not have the ability to safely offload, then for a nominal charge the steel company will unload for you. This does have to be scheduled in advance – as the steel company may otherwise load your order onto a truck which does not have offloading capabilities. 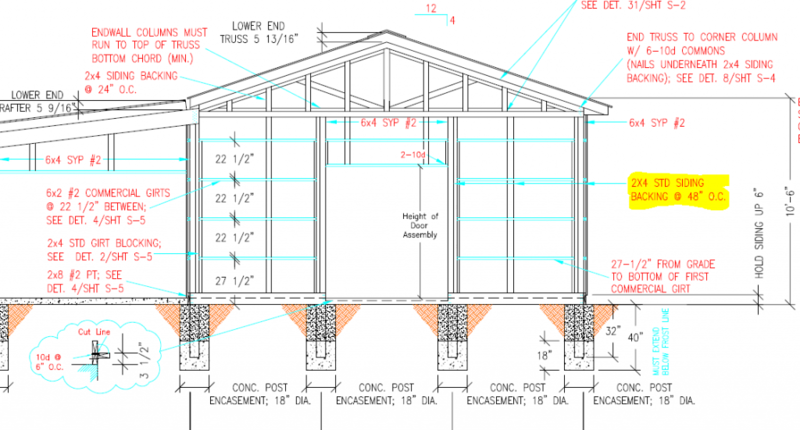 This entry was posted in Pole Barn Questions, Building Overhangs and tagged treated posts, endwall overhangs with double trusses, overhangs on pole barns, pole barn engineering, pole building endwall overhangs, steel offloading, treated columns; pressure treated columns on June 8, 2015 by admin. The Building Codes (IBC – International Building Code and IRC – International Residential Code) specify minimum requirements for pressure treated lumber used to structurally support buildings. Hansen Pole Buildings Designer Kelly brought to me the question (posed by one of his clients) about the available (and feasibility) of the utilization of greater levels of preservative treatment chemicals for wooden columns embedded in the ground. Higher levels of pressure preservative treating are available for pressure treated lumber. However they are going to be done by special order at the pressure treating plant. Special orders come with “special” (read – higher, sometimes MUCH higher) pricing, as well as extended periods for delivery of product. The reality is, if the Code requirements will last the useable lifespan of the building or more, an increase in the treating levels is probably not the best investment of a building owner’s hard earned funds. If one is skeptical (or even unbelieving) about the ability of properly treated pressure preservative columns to last when embedded in the ground, there are some alternatives. Plasti-sleeves® https://www.hansenpolebuildings.com/blog/2012/04/plasti-sleeves/ or Post Protectors™ can be placed over the in-ground portion of pressure preservative treated columns to isolate the wood from contact with the surrounding soils. Carrying the argument even further, columns can be removed from ground contact completely! Engineered brackets are available which allow columns to be mounted to foundations, or even concrete piers which are poured into the ground: https://www.hansenpolebuildings.com/blog/2012/09/concrete-brackets-2/. Also available, are patented pre-cast concrete short columns with brackets on top, which can be placed into previously augured holes and the wood columns are then attached to the brackets. The end game is, there is a design solution available to fit every future building owner’s level of comfort and pocket book when it comes to pressure treated lumber. This entry was posted in Lumber, Columns and tagged treated posts, post protectors, plasti-sleeves, pressure preservative treated columns on March 26, 2015 by admin. Dear Guru: Will a Treated Post Rot in the Ground? DEAR KENNEWICK: Will they rot? Maybe eventually, but none of us will live long enough to witness it. The probability of a properly pressure treated post rotting off is small. Small enough so over my three plus decades and 15,000 buildings of experience, I’ve never experienced it happening. Keep in mind I said “properly treated”. There are companies who “treat” their poles but not with the right procedure and proper depth of treatment. Make sure you are purchasing a pole building with properly treated poles! As to the lifespan of a pole building, unless hit with an unexpected natural disaster, or the building is purposefully torn down, as long as proper maintenance of the siding and roofing is done, there would be no reason to not have the building standing hundreds of years from now. DEAR ANONYMOUS: Browns Valley, MN. And where is Browns Valley, MN? This is probably one of the most often asked questions from our clients. By road, Browns Valley is 107 miles south of Fargo, ND; 209 miles west of Minneapolis, MN; 173 miles north of Sioux Falls, SD and 1596 miles east of Portland, OR. If you were to place a map of North America on a dart board, and threw a “bulls-eye”, you’d probably hit Browns Valley! Hansen Pole Buildings’ offices and warehouse is located on the South Dakota side of Lake Traverse (of course everyone knows Lake Traverse is the southernmost point of the Hudson Bay watershed and on the continental divide where supposedly if a raindrop fell on the bulls-eye – it would divide and go three different directions!). Yes, we are really in the state of South Dakota. Like many rural border towns, our mail is delivered from the nearest post office, which just happens to be in Minnesota. We are an internet based company, which means it doesn’t really matter “where we are”, as we design and sell buildings in all 50 states, including shipping to Alaska and Hawaii. Since most of our products do not ship from our home office but from locations often within 25 to 100 miles of anyone’s building site – shipping is included in the price of every custom designed building kit. So to better answer the question “where are you”? Everywhere! DEAR DARWIN: AS long as you are not relying upon the old concrete slab to support the weight of a new building, it should be fine. Concrete is one of the best fire-resistant products found in building construction. However, intensive heat affects the strength of concrete. I normally would recommend to building the new building larger than your existing slab. Allow enough room around the perimeter to allow for easy digging of holes – say 44 feet by 74 feet or larger. A narrow strip of concrete can then be poured between the existing slab and the new pole building skirt board. If you do not want to go larger, it is possible to use a concrete saw to cut out portions of the slab where the building columns will be located. Again, allow for easy digging of holes, by making the cutouts six to 12 inches larger than the diameter of the hole to be bored. This entry was posted in Uncategorized, Lumber, Pole Barn Questions and tagged pressure treated posts, treated posts, rotting columns; posts deteriorating on August 19, 2013 by admin. Dear Pole Barn Guru: Will Poles Rot? Welcome to Ask the Pole Barn Guru – where you can ask questions about building topics, with answers posted on Mondays. With many questions to answer, please be patient to watch for yours to come up on a future Monday segment. DEAR JIM: Without knowing exactly what your objection is to the fairly industry standard screws, it is difficult to properly address the concerns you may be having. I’ve seen many alternative screws, however have yet to hear raving reports back as to ease of installation or satisfactory performance. Generally people who are looking for an alternative have had issues with either the neoprene rubber gasket decaying (resulting in leaks), the paint chipping off from the screw heads, or the screws themselves rusting. Years ago we went to using a screw which offers the ease of installation of the standard ¼” hex head – but with many improvements. Featuring EPDM gaskets, powder coating, and JS500 plating, the manufacturer guarantees these screws will outlive the steel they are attaching. DEAR MISPLACED: You have just discovered one of the many reasons to not construct pole buildings using round poles – they are difficult to build with. By the time you project is completed, you will have chewed up enough extra time, energy and effort to have made paying for dimensional posts (4×6, 6×6, etc.) a bargain. Back to the problem at hand…flat to flat is going to give the most solid connection. I’d recommend cutting the posts to give flat surfaces at all connections. Assuming the posts are treated with preservative chemicals, be sure to wear all appropriate safety gear when cutting. Unless countersunk (adding more time and effort) lags or carriage bolts have heads which will protrude and cause problems when it is time to install siding. This entry was posted in Lumber, Pole Barn Questions, Constructing a Pole Building, Powder Coated Screws and tagged pressure treated posts, treated posts, powder coated screws, round poles, treated timbers on July 22, 2013 by admin. I first became involved in the post frame (pole) building industry over three decades ago, in the Willamette Valley of Oregon. At the time, many of the region’s pole barn builders were buying the lumber for the pole buildings they were selling to consumers from Withers Lumber in Brooks, Oregon. The “special” thing about this particular lumber yard is they maintained a tremendous inventory of timbers (4×6, 6×6, etc.) which were treated with a product called pentachlorophenol, or “penta”. First produced in the 1930’s, penta (aka PCP) is used as a pesticide and also as a disinfectant. PCP is produced by the chlorination of phenol in the presence of a catalyst such as anhydrous aluminum or ferric chloride at temperatures approaching 200 degrees Celsius. Phenol (also known as carbolic acid) was first extracted from coal tar, but today is produced on a large scale using a series of processes which begin with crude oil. Phenol requires careful handling due to its propensity to cause burns. As a wood preserving agent, raw wood (poles or timbers) are placed in a treating tube, where they are immersed in PCP and subjected to pressure – forcing the chemical into the wood. Utility poles, treated with PCP, have an approximate useable lifespan of 35 years. Short-term exposure to large amounts of PCP can cause harmful effects on the liver, kidneys, blood, lungs, nervous system, immune system, and gastrointestinal tract. Elevated temperature, profuse sweating, uncoordinated movement, muscle twitching, and coma are additional side effects. Contact with PCP (particularly in the form of vapor) can irritate the skin, eyes, and mouth. Long-term exposure to low levels such as those which occur in the workplace can cause damage to the liver, kidneys, blood, and nervous system. Finally, exposure to PCP is also associated with carcinogenic, renal, and neurological effects. The U.S. EPA (Environmental Protection Agency) classifies PCP in group B2 (probable human carcinogen). The pole builders (as well as the lumber yards) who were espousing how wonderful penta treated posts were, exposed themselves and their employees to PCP by direct skin contact. Since the early 1980s, the purchase and use of PCP in the U.S has not been available to the general public. Nowadays most of the PCP used in the U.S is restricted to the treatment of utility poles and railroad ties. In the United States, any drinking water supply with a PCP concentration exceeding one part per billion must be notified by the water supplier to the public. Disposal of PCP and PCP contaminated substances are regulated as hazardous wastes. This, in itself, is plenty of reason why I would never, ever consider the use of a used penta treated utility pole in any portion of a pole barn. This entry was posted in Lumber, Pole Barn Planning and tagged treated posts, wood treatment, penta on November 20, 2012 by admin. When I was just a little tyke, my Mother used to watch Art Linkletter’s “House Party”. A highlight of his show was the segment, “Kids Say the Darndest Things”. I have my own version, “Potential Building Owners Say the Darndest Things”. Our Building Designer Lauri seems to be a magnet for these lately. Here she shares another one…. “Speaking of the poles. I don’t want to sound like a picky little prig or an officious jerk but I do have a requirement about the bottoms of the poles. I don’t know what your standards are for the poles, but I do not want the bottom of the poles sitting in a concrete cup. 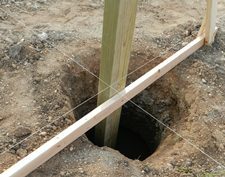 When the holes are dug for the poles I would like them to be dug about a foot deeper than needed. Then the bottom of the hole can be filled with at least 6 inches of cracked limestone or 2B river wash stone. Ah, where to even begin? Let’s talk about pressure treated posts. Rotting fungi need water to work. Other conditions necessary for wood rot to develop include a supply of oxygen and temperatures between 32 and 90 degrees Fahrenheit. (Decay stops below 35 degrees and above 100 degrees.) Wood becomes susceptible to rot if its moisture content exceeds 25 to 30 percent. Keep wood dry, it will literally last for centuries. On the other extreme, if the wood is 100 percent saturated with water, the decay fungi won’t get the oxygen they need. Decay won’t occur, and the wood can last for centuries. Nowadays building columns are pressure preservative treated for structural in ground use. They are designed to last lifetimes, under the most adverse conditions. If the soil at the site drains well, there is no reason to place rock or gravel beneath or under a column to “drain water away”. If the soil at the site does retain water, any gravel in or around the base actually becomes a collection basin for water, rather than allowing water to drain “off”. In a quick summary, this customer came up with a poor investment in rock and the labor to dig deeper holes. Plus, this person added chance of the building settling due to inadequate compaction of the stone. Other previous blogs have covered topics such as the lifespan of pressure treated posts, the need for concrete column backfill to resist settlement, uplift and over turning, as well as why not to use “cardboard casing” (better known as sonotubes). While I appreciate customers who are concerned about the longevity of their buildings, it is best to leave the structural design of buildings to the experts – registered design professionals (RDP’s). A RDP (or P.E., i.e. Professional Engineer) has not only the complete educational preparation, but also the decades of experience needed to combine proper structural design and efficiency of materials. This entry was posted in Constructing a Pole Building, Pole Barn Structure and tagged posts rotting, pole building columns, treated posts, columns rotting, post decay, treated posts in concrete on July 25, 2012 by admin. Pressure-treated lumber has been available for about 60 years. Most original formulas centered on arsenic as the main preservative, to help lumber withstand the extremes of outdoor use. While over time small amounts of chemicals from treatments such as CCA may have leached out of the treated timbers, a 2004 report in Wood and Fibre Science stated soil contamination due to the presence of CCA treated wood after 45 years is minimal. As one might expect, the use of a potentially-poisonous substance like arsenic was cause for considerable concern, particularly when children are exposed to such installations. 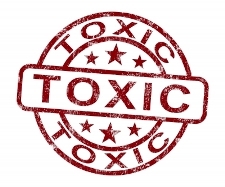 However, a Florida Department of Health panel of physicians found no published clinical evidence in the medical literature of arsenic poisoning in children resulting from CCA treated playground equipment exposure. 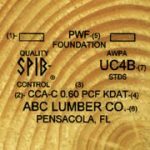 To address the pressure treated wood safety concerns, in 2002, the United States’ Environmental Protection Agency convinced lumber manufacturers to find a non-arsenic based formula for treated. The result was ACQ (Alkaline Copper Quartenary) treated lumber. The new ACQ treated lumber contains a very high level of copper to replace the arsenic. While this reduces the desired risk of poisoning, it does present a different, but very dangerous problem: increased levels of corrosion. Simply put, ACQ treated lumber is extremely corrosive to metal fasteners such as nails, screws, framing hangers as well as metal siding and flashings. The problem is you end up with two metal compounds in direct contact with each other in an exterior application so water contact is going to happen. When two metals in direct contact with each other are surrounded by an electrolyte (water) rapid corrosion of the metal on the lower end of the electromotive series will occur. Significant issues were seen early on in the outdoor deck industry. Here, standard joist hangers decayed rapidly due to the chemical interactions. In post frame construction, the biggest concern was with contact of the pressure treated skirt boards (splash planks) with steel base trims or steel siding. Most quality providers went to isolating the skirt boards from the steel by uses of waterproof barriers and fastening the steel at the base of the walls with stainless steel screws. Nails with higher levels of zinc coating became prevalent as well, for fastening ACQ treated lumber. The end solution was the short popularity of ACQ treated lumber. Copper Azole (CA) and Micronized Copper Quaternary (MCQ) have now become the pressure treatments of choice, as they have significantly lower tendencies towards the electrolysis issues seen with ACQ. While MCQ is less corrosive to metals, one of the “big box stores” continues to recommend the use of galvanized fasteners with it. This entry was posted in Lumber and tagged CCA treated lumber, treated lumber, treated posts on June 4, 2012 by admin.